Since I haven't been able to get Blogger to cooperate with my pictures, I'm trying out the Flickr "blog this" tool. Pretty cool! I never knew how to use this feature, but it seems to be an easy way to keep my blog and my Flickr stream in closer sync with each other. 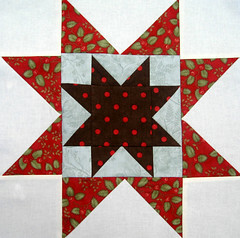 Here's the fourth block from the Fat Quarter Shop's Designer Mystery Block of the Month. Since it's a mystery, I hope it's OK that I'm showing pictures on my blog! I found it to be a difficult block to make, at least from the perspective of lining up all of the points (as you can clearly see). But I liked the look of the block to make two more in different fabrics ... those pics to come! I really like the block! Which Flickr tool is it that you used. I would love to know, because I also sometimes have trouble loading pictures. It's a beautiful block! I love the center fabric. You are a very talented native Brooklynite. I know this is an old post, but just wanted to say KUDOS on the Designer Mystery block, and it's definitely alright to show them. We love to see them!